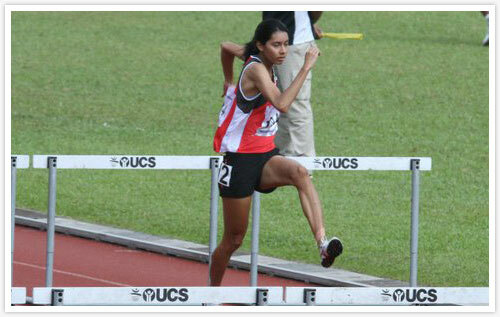 During the last weekend on Day 2 of Singapore Athletic Association’s inaugural Track & Field Series, the competition saw Dipna Lim Prasad, a freshman from Nanyang Technological University, broke her own mark in the 100m hurdles women’s event (Pending ratification by SAA). The Sports Science and Management undergrad on two occasion in a single day lowered her previous record of 14.72 seconds, which was achieved in 2009, at Kuala Lumpur, Malaysia. With a tailwind of 1.9m/s, Dipna ran the morning session (10.35 a.m.) race with a time of 14.69 seconds. Upon reaching the bleachers, she was elated to find out that she ran three hundredth of a second faster than her old mark. Some three-hour plus later, the 19-years-old showed it was no fluke, when she ran the afternoon session (2.10 p.m.) race in record time once again. This time finishing even faster than her last run. The clocked stopped at 14.56 seconds, with a tailwind of 0.1m/s. Currently coached by her Georgian coach Viatcheslav Vassilev, Dipna commented she wasn’t expecting the record, considering she’s just into her preparatory phase of her hurdles training. She was previously advised by the doctors to lay-off hurdling for a year due to an ankle injury. Lowering your record twice in a day, did you expected that? Dipna on the far right, Lane 2, running the morning session, finishing in a new national record of 14.69 seconds. Video too small, download this race in HD quality. You’re in good form currently, be it in the hurdles and the sprints races, which event will you be giving more focus for this year? I doubt I will be focusing on one particular event. I will definitely be working hard to improve on my hurdle run. But at the same time, my coach Slava will incorporate sprints into my workouts to maintain my speed! My main goal is to qualify for the SEA games. I will be going into another preparation phase soon to try and be in better form for the overseas meets in mid-year. I would say that my progress and preparation thus far is slow and steady as my coach and I are very cautious as to aggravate my ankle injury. But overall, it’s all good.